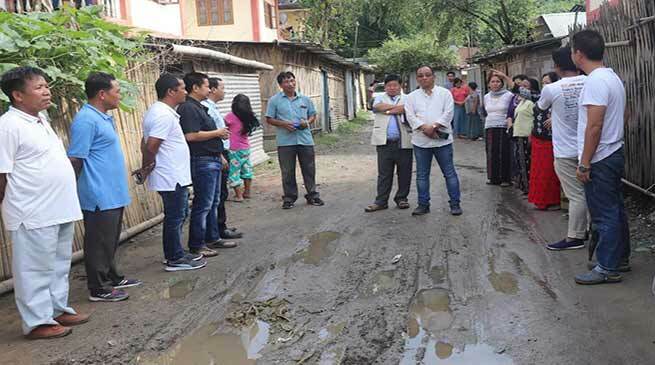 Itanagar local MLA and Parliamentary Secretary PWD, Techi Kaso, today visited the APP 1st Battalion Colony to take the stock of condition of the colony road in the campus. The local leaders of the Chimpu which include Youth leader Lokam Anand and women of the Battalion of 1st APPBn Colony apprise MLA Kaso about the pathetic condition of the road, specially during monsoon the road become muddy. In this condition it is very risky drive their vehicle and even walking. MLA who was accompanied with the official of PWD Capital Division A directed them to take care of the said stretch of road and directed them to prepare proposal for repairing and renovation so that it would be taken up in the winter for long lasting. Kaso also visited other parts of the Battalion colony and asses the demand of the people and interacted with the local residents and housewife of the police personnel.